giving us a chance to head back outside and enjoy nature. With the change of seasons on the horizon, it's the perfect time for a picnic! 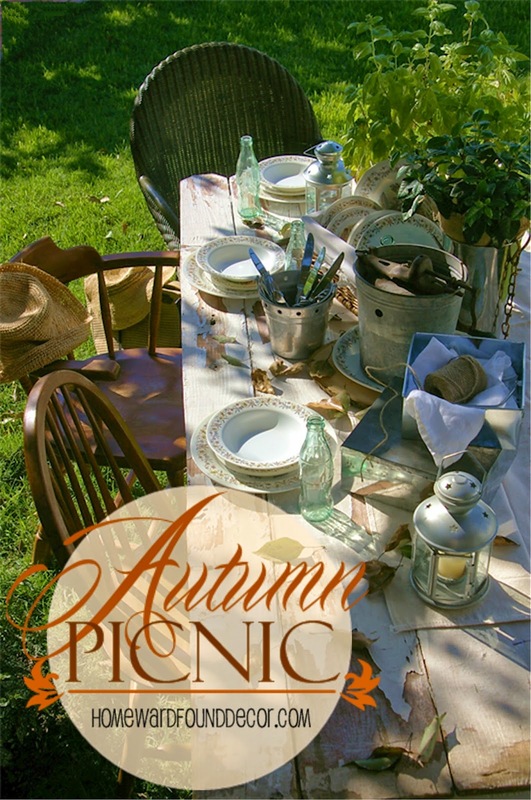 Picnics can be elegant and fancy, plain and simple, or somewhere in the middle. For me, whatever they look like, they should be EASY. it's not a massive meal, just a tasty repast of bread, fruit, cheese, wine, and water. in the park, at the beach, in the mountains, or even in your own backyard garden! while a small galvanized bucket holds flatware. * Vintage galvanized cookie boxes hold bread, fruit and cheese. * A 'new but looks old' galvanized napkin holder fits right into the look. * Water is presented in re-used glass soda bottles instead of plastic. * Galvanized candle lanterns hold citronella candles to ward off pests. (I've never seen another like it!) and oh, does it work fast! and can come off to lay on the ground for an afternoon nap, too! There's something really special about this table scape... it's the dishes. They ARE vintage, but aren't fancy or precious or particularly valuable. Just sentimental. along with a pretty floral border in brown and gold tones. these dishes have been known as 'the picnic dishes' in my family. They belonged to my Grandma Ward, and she brought them out for every camping trip and picnic. She kept them in her truck camper's 'kitchen box', and then in their little Shasta travel trailer. and these dishes were my toys. sneakily culled from Grandma and Grandpa's garden. After I grew up and had my own family, Grandma gave me her dishes. So we used them for camping trips and backyard barbecues and picnics at the beach, too. Don't let the fact that summer is over keep you inside! Sounds like excellent and relaxing fun. Brenda - that's EXACTLY the idea!!! love a picnic! particularly one as beautifully set as this! Thank you, Shari! It was fun to pull this look together - and it took me only about 20 minutes! Makes me want to set an autumn picnic table for dinner. You should, Lani! It's easy!!! Especially if you set it up in your own backyard! Vino, Cheese and pears....I will be right over!